The Headwaters Nature Trail is a work in progress spearheaded by the joint efforts of the Fairfield Township Trustees and volunteers for the local Boy Scout and Girl Scout organizations in the area. Be sure to follow this page for ongoing progress on this wonderful addition to Fairfield Township. Fairfield Township. No one thought they would discover Mill Creek started in Fairfield Township. 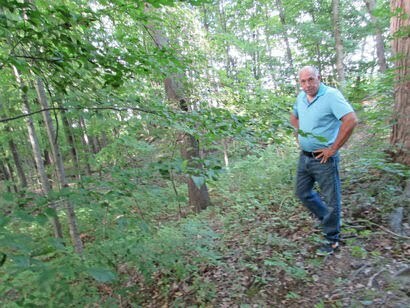 The idea to do something with 16 acres of township property the government building sits on at 3062 Fairfield School Road occurred to Miner late last year, and since then a two-phase project has taken shape that will include a walking trail, observation deck, benches and information boards. And it will all help connect people with nature and local history. "As a trustee you try to do something for the township," Miner said and Trustee Chairman Bob Hum and Trustee Carl Garwood lent their support and backing with the township putting $10,000 aside for the headwaters trail. Miner said $500 was spent up front to make sure they stayed on township property by surveying the land on which Old School Lake is a prominent feature. An additional $2,200 has been spent for four tan benches and shipping. "Right now that's the only thing we've purchased," Miner said, adding that local vendors and businesses have supported the Boy Scouts with materials for a 12 by 20-foot pavilion and a large information board. The nature data that will be used on the board is a project that Girl Scout Troop 80777 is working on. The Ohio Geological and Historical Quarterly ran a large piece in its April 1934 edition on Mill Creek Park while zeroing in on the water source. In 1933, amid a "host of prominent local folks" who made a pilgrimage to the homestead of William N. Cope where, with a christening poem, it was dedicated as the source of Mill Creek. C.B. Galbreath, the state historian and secretary of the Ohio Archaeological and Historical Society, was the principal speaker. Cope later sold the farm with the stream flowing under it to H.H. Pierson and it became known as the "Headquarter Farm" at R.D. 2, Columbiana. As the spring source, it is three miles south of Columbiana, and just on the other side of a tree line to the south of township property. It was a pretty big deal. Miner said, "The headwater starts in the basement of a house. It sits on a spring and runs north." To give an idea of its flow, Miner said the stream runs under state Route 14 by Arby's and the Farmer's National Bank into Mahoning County. So far Phase I of the Headwater Nature Trail is pretty much complete. "There are three or four items left in Phase I," Miner said Tuesday, "it will be interesting to see how much interest we get because I know the youth are looking for these types of projects." Envisioning the Headwaters as the beginning, Miner would like to obtain grant money for the future evolution of the project and looks past Old School Lake to where an old softball field and football field were once alive with teams practicing. "I hear there's grant money out there," he said. There is also a 12- by 20-foot observation deck that will face north where visitors will be able to view the tributary with a handicapped accessible path to it from the information board. Miner said the path will be either asphalt or chip and seal. A split-rail fence will define the Headwaters area, running some 140 feet along the western edge of the area. A lot of the remaining work, which will be in Phase II, will take place next summer. It will be labor intensive, such as clearing tree limbs, putting in boundary posts, trail marking and clearing, Miner said, adding he hopes to reach out to the community for assistance with those. For now "everything has lined up," Miner said, but there's a way to go. To learn more about the project please read original story here. Media Credit Salem News, Larry Shields, Reporting. project. An adjacent pavilion is also part of this project. 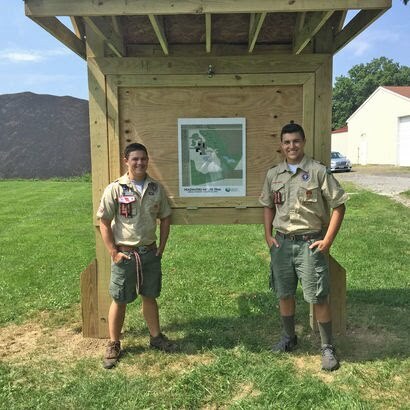 T.J. Carr, a local Eagle Scout Candidate from Troop 22 in New Waterford, Ohio proposes his Eagle Scout Project as an addition to the Headwaters Nature Trail.